For those of you that are as unaware of who S. Weir Mitchell was as myself, I will fill you in on a few details. He was born in 1829 and died in 1914. He was the son of a physician and became one himself. He practice medicine during the Civil War and at the end of the war became a specialist in neurology. He has a disease named after him (erythromelalgia) which, of course, would be anyone's great honor. To best that (perhaps) Wikipedia notes that he held "a leading place among the American authors of the close of the 19th century." However that's Wikipedia and I'm not sure how much I trust that. I had never heard of him before but that doesn't really mean very much. Perhaps you have and have read something by him? I'd love to know of it, if you have. 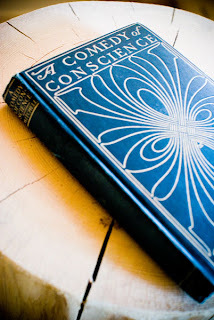 A Comedy of Conscience was written in 1904 according to all the online sources that I checked. However, the copy I hold in my hand was copyright 1900 and published March 1903. (It's weird to think that the book I hold in my hand is over 100 years old!) And a hundred years forgotten! And really - it could stay so! The dialogue in this book, while being a bit confusing, reminded me of Go, Dog, Go! by P.D. Eastman. "Do you like my hat? No, I do not like your hat! Comedy had about the same amount of clarity. The story line was a bit on the ridiculous side and I have a hard time believing that anyone, at any period in history, could have found it that fulfilling. It's the story of Serena Vernon, a "spinster by choice" who, taking a ride on public transportation and has $34 stolen from her purse. During the theft, the thief accidentally loses a valuable diamond ring which slips off his finger during the crime. She spends the rest of the (mercifully short) story agonizing with her conscious over whether it is proper for her to keep the ring, find it's rightful owner and whether or not the rightful owner is, in fact, the thief who stole from her. But the cover! The binding! Well, that's classic. I'm not sure what kind of physician Mr. Mitchell was. However, I'm inclined to think that medicine was more his gift than writing was. This being the only work I have read of his though, I cannot say with certainty. I CAN say that I won't be hunting out any more of his books. It was an interesting enough read but nothing exciting. That being said, it sure looks pretty on a bookshelf! Not that the book has anything to do with this book, but have you ever read any of E. P Roe's books? Particularly, "He Fell In Love With His Wife" -- not at all what you expect (sappy pathetic book), but a sweet book written around 1860 or so. I only mention it because the era that A Comedy of Conscience was written is about the same. Rats, I was hoping to come across an unknown author who was really good. I guess there's a reason we don't hear much about him. Even so, the book itself is beautiful.